Lately, we’ve been making a lot of southern European dishes and we felt we needed a break, but we were also looking for a dish that wouldn’t take all night to make and require us to buy a load of ingredients we’d use for one dish and then sit and rot in our refrigerator. So, we decided to go old-school Japanese-American style and make a dish so reminiscent of the 1980s that you’d almost expect to look up from your plate and find Mr. Miyagi and Daniel-san across the table. But instead of accompanying this dish with some studied fence-painting or the practicing of our wax-on, wax-off technique, we went for a really simple scallion salad called Pa Muchim we’ve been loving at Korean restaurants lately. We’re entering this into this week’s “Weekend Herb Blogging” event hosted by Coffee and Vanilla. Turn on your broiler to high and place a sheet of aluminum foil over a baking sheet and oil lightly. Cut salmon fillet into two roughly equal portions and coat lightly on all sides with miso past, probably about half of it.Heat your wok or skillet to very high heat and add peanut oil. Then, quickly toss in the carrot and green beans. Allow to cook, moving constantly for about a minute until beans start to wrinkle a bit. Hit pan with ginger and garlic. When you can smell these nicely, add the mirin and soy sauce, followed after a couple of seconds by the udon noodles. Stir these together so noodles are well coated with sauce and vegetables and then remove to a plate. Slap salmon under broiler (skin side down first). After between 1-2 minutes or until miso starts to caramelize, turn fish over and broil for another 1-2 minutes skin side up. 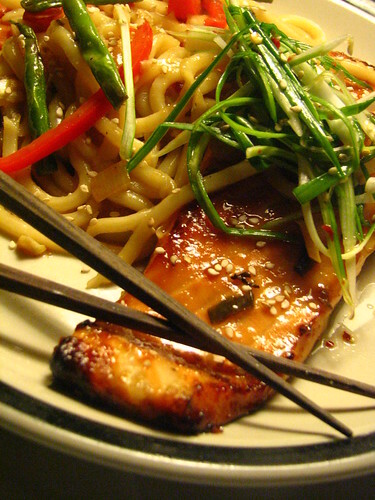 When skin is crispy and glazed-looking, remove fish and serve over the noodles and top with scallion salad (pa muchim). Slice scallions lengthwise into fine strips (1-2mm or 1/16inch wide) and submerge in cold water until curled – 30mins-1hr. Drain well and place in a bowl then dress with remaining ingredients. Serve either as a garnish, side dish or panchan (mixed korean starters) to your favorite Asian dish. As for this dish…it’s one of those Pan-Asian, Gwei-lo-friendly dishes that I enjoy very much. The photos are fab and you’ve sold me on the scallion salad…sold! I think a dish like this is suitable for all decades. I need to start using Miso Paste more. That looks good! Broiled miso glazed salmon is one of my favorites. The scallion salad sounds interesting. even if it screams 80s, I think it’s a great recipe, and I like the addition of the scallion salad. Things like this – that you can cook quick on a weeknight, after a day at work are really undervalued, and I’m happy to have this in my set of recipes. This looks delicious! What are the noodles in the background? The noodles are Japanese udon noodles. If you look in your grocer in the section they sell the wonton wrappers, they may have fresh udon or soba noodles for sale. If they don’t, see if they have dried soba. Basically, udon noodles are a thick wheat noodle and soba are the thinner buckwheat noodle. We’ll be making something soon again w/ them so stay tuned! Your salmon looks delicious. 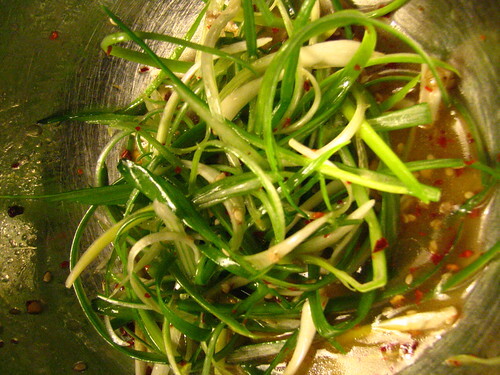 I love the salad too, scallions (or spring onions to me) are something I always have around. Sadly, I don’t have a copy of the karate kid myself..
Eighties? Bah. This looks colorful and delicious. I don’t have any salmon on hand, but I think I might make noodles for dinner. on the lighter side of life – that plate looks wonderful. i’m not a huge salmon lover but i like it ok – and that glaze would do me just fine… i forgot about the ol’ miso glaze. hey mix it with honey and it could be the “miso honey” salmon dish… hee. I love salmon any which way, but this one looks especially nice. YUM. This salmon looks great! I’ve been looking for a recipe like this. I can’t wait to try it! Thanks! I made something nearly a dead ringer last weekend, following a recipe I received as host for WHB. Good taste like this transcends all eras. Kudos to you for keeping classic. Looks wonderful. Love the color on this plate and udon noodles are the best…soft, moist and carries any flavor beautifully. 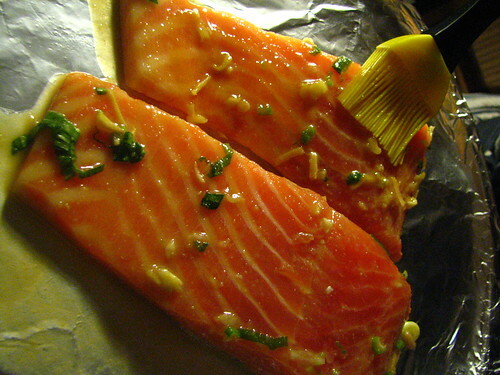 A delicious way to have salmon! So different from the flavours I’m used to… I should give this one a try!!! I’m always looking for a new way to cook salmon- looks wonderfully healthy and what’s not to love about cooking a quick and tasty meal! This looks like a fantastic meal. I’ve been wanting to cook more with miso, and this recipe looks like a keeper. Hey, Ellie. You’re totally right. my husband spelled it correctly in about 2 places, then must’ve put an ‘n’ instead of ‘m’ on the end the rest of the time! THANKS for telling us what the word means… it totally makes sense. muchim…dressed. like it! I made this dish last night and it was easy and excellent. The flavors compliment each other very nicely and I will definitely use the recipes again. The only change that I needed to make was to broil the fish for more than 2 minutes (rather 3-4 minutes) on each side. I guess that would depend on the thickness of the salmon fillets one uses. Thanks for the delicious recipes! SE – thanks so much for the feedback! We’re delighted you enjoyed the dish. We should put a note on the recipe warning people of the difference in cooking time based on the fillet’s thickness – good point. I guess another point of variation would be the strength of your broiler and the distance between it and the top shelf of the oven.